Moe Creations: Action Wobble Challenge! It's time for another challenge over on the Action Wobble Challenge blog. 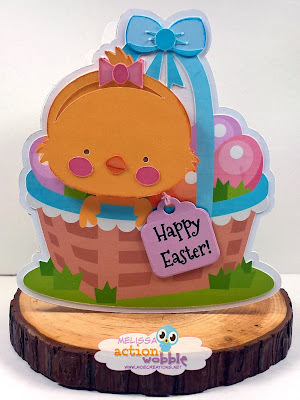 This months theme is Easter, so anything Easter related is perfect, with an Action Wobble of course. Now onto my card, this image was a freebie a couple of weeks ago from Miss Kates Cuttables and I turned it into an adorable shaped card, love how it turned out. If you would like to see this little cutie in action just head over to my YouTube Channel, be sure to subscribe so you don't miss anything!